Increase your productivity and comfort. Using a telephone and headset solution can increase your productivity by allowing you to handle other tasks while talking on the phone. Additionally, the use of a headset can reduce neck, upper back, and shoulder tension allowing for a more comfortable work environment. 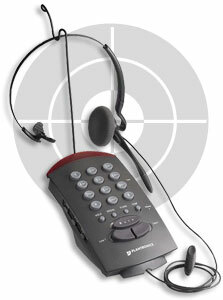 Experience the freedom, comfort and great sound quality of a Plantronics Headset Telephone Solution. Do more. Comfortably.